Below are links to our most frequently asked questions and help topics at WesSpur.com. Please feel free to contact us directly if you do not find the answer below. We welcome your inquiry and strive to make our customer service the best in the biz. The WesSpur catalog can be downloaded as a PDF here. The free shipping offer covers UPS Ground. UPS Ground runs Monday-Friday. Stump Grinder teeth and Chipper Blades eligible for the free shipping offer are shipped via USPS Priority Mail, in Medium Flat Rate Boxes. UPS Ground requires a physical address for delivery (no P.O. boxes). *Residents of Alaska & Hawaii receive the best shipping rates via USPS Priority Mail, and may request a shipping discount equal to the cost of sending a similar package within the contiguous U.S.
**Oversized items, such as pole saws, will be charged a separate flat fee of $15 for shipping within the contiguous U.S. You may order multiple oversized items and they will be covered by the original fee. Other items on the order will receive free shipping if they qualify. **Overweight items, such as reels of cable, will be charged a separate shipping fee. Reels of cable typically cost $40-50 to ship within the contiguous U.S.
Orders of in-stock items placed before 1:00PM Pacific Monday-Friday will be shipped the same day. Back orders, incorrect shipping or credit card billing information, or custom orders may delay shipping. WesSpur is closed on weekends and major U.S. holidays (Christmas, New Years Day, Memorial Day, Thanksgiving, Labor Day, and 4th of July). All orders placed on the weekend or major holidays are shipped on the following working day. Back-ordered items may delay the shipping of your order up to 48 hours. If the delay is expected to be longer, we will normally ship all in-stock items and send the back-ordered item when it arrives, at no extra shipping fee (within the contiguous U.S.). We will contact you if there is an item on your order which cannot be sent right away. 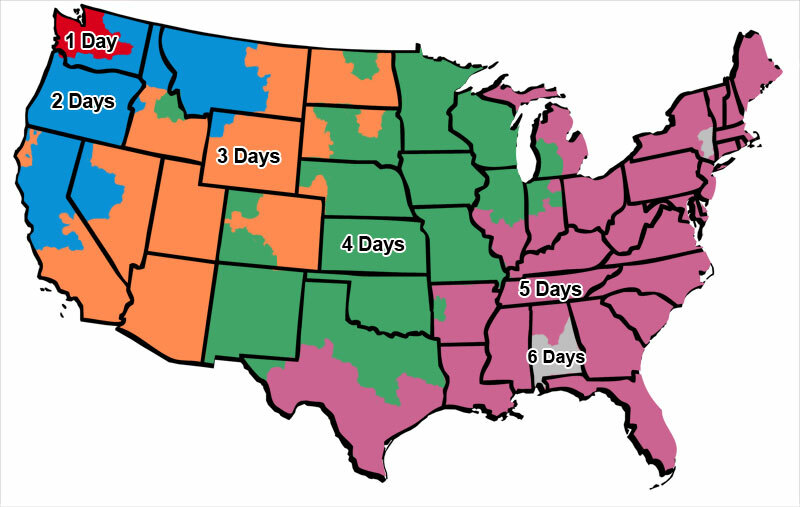 These maps show the number of business days (M-F) in transit for UPS. Priority Mail is 2 to 3 business days within the contiguous U.S. Please note that only Next Day Air Saturday Delivery will deliver on Saturdays, and that the day the package shipped is not included in these times. Saturdays, Sundays and major Holidays are also not counted in the shipping time. Saturday Delivery is available for Next Day Air packages in some areas, and must be chosen during checkout if an order placed Friday is to arrive Saturday, otherwise Next Day Air packages shipped via Next Day Air on Friday will arrive on Monday. Please note that shipping times guaranteed by UPS are not guaranteed in the face of delays caused by forces outside of their control, such as inclement weather or disasters. When you complete your order, you will see your order confirmation number. You will also receive an email when your order ships that will display the tracking number. Finally, you can login to your WesSpur account if you opted to have your information saved when you placed your order, and view the progress of all your orders. Tracking numbers are generated when your package labels are printed, but are not active until after your package has been picked up and scanned it into their system. What's the best way to ship to Alaska or Hawaii? Shipments to Alaska and Hawaii are not eligible for Free ground shipping, though you may request a discount on shipping charges on orders over $99. The best way to ship to these states is usually USPS Priority Mail. It is relatively inexpensive, tends to be both reliable and relatively quick (5-7 days), and is the most popular option for our tree climbing customers in Alaska and Hawaii. UPS and FedEx also deliver to these states, but are more expensive options. Air services such as 2 Day Air and Next Day Air are not guaranteed to arrive within the stated term. They are usually close, but not always on time and can be fairly expensive. It is sometimes difficult for our website to calculate these costs accurately and they are occasionally wrong. In these cases, we have to manually override the freight charges and will notify you of any changes. WesSpur ships around the globe to tree climbers in many different countries. Shipping rates vary widely from one country to the next, and are not always correctly computed during checkout. Shipping by USPS Priority Mail International is often the least expensive method, and is both reliable and relatively quick (4-10 days, not including time spent clearing customs). UPS and FedEx offer faster shipment and have the benefit of online tracking numbers, but they are usually more expensive, and may require customs brokerage fees. These fees are charged by the carrier and we do not have a way of advising you of the cost before UPS or FedEx deliver the package. Your local government may charge duties, import fees, or tariffs on your package when it arrives. Check with your postal officers for information on the taxes and duties you will be responsible for. WesSpur does not have a way of advising you of these duties before your package ships, and the receiver of the package is solely responsible for them. We are happy to provide a custom shipping estimate for your order. We will need your full address and list of items to calculate shipping accurate. Please contact us for a shipping quote. We are open Monday through Friday, from 7 AM to 5 PM. We are closed on weekends and major holidays (Christmas, New Years Day, Memorial Day, Thanksgiving, Labor Day and 4th of July). Our website runs all day and all night every day of the year. 2121 Iron Street, Bellingham WA 98225. WesSpur's warehouse in Bellingham, WA also functions as a retail store. You are welcome to visit us to see the gear in person, try stuff on, and ask for advice on purchasing your tree climbing equipment. Enter your ZIP code below for driving directions. We have added a loyalty program to say "thank you" for getting your tree climbing gear at WesSpur. To redeem your loyalty points for gift certificates, you can call WesSpur at (800) 268-2141 or login to your account and click on "redeem loyalty points" on the my account tab. Enter the number of points you would like to redeem from your available total, and a Gift Certificate will be e-mailed to you for the amount you have redeemed. WesSpur points can be redeemed for gift certificates at a conversion rate of $1.00 per 100 points earned. Points have no monetary value until turned into a gift certificate. Gift certificates must be used toward purchases and do not have a cash redemption value. Gift certificates created with points will expire 1 year after date of creation. WesSpur Tree Equipment, Inc. reserves the right to discontinue the WesSpur rewards program at any time. Points not used at that time will be considered expired. Gift certificates will not be affected by a cancellation of the program, but will expire on their normal expiration date. Points are only available on Retail purchases. Wholesalers and volume-based discount orders do not qualify. WesSpur reserves the right to correct any system or human error that causes the wrong amount of points to be issued or an incorrect gift certificate value to be issued. Points may not be combined between non-related accounts and are non-transferable. Wholesale and corporate-discount customers are not eligible. WesSpur reserves the right to change the terms of service at any time. In the case where the terms are changed email notifications will be sent out with the changes. Your information will not be shared with anyone outside of WesSpur. By checking the "agree to WesSpur Loyalty Program terms of service" during checkout or in the account tab, you agree to the above terms and conditions. WesSpur is located in Bellingham, WA in the U.S.A. We are a short drive from Vancouver, BC in Canada. (See the Map to WesSpur.) We do business all over the world and can accept Visa, Master Card, American Express, Discover Card, and PayPal payments. For very large international orders we will need to arrange payment via wire transfer. Please contact us to inquire about wire transfer. USPS International Mail is available either as Priority Mail or Express Mail. Priority Mail is usually very reasonable, and is quoted as 6-10 days delivery time, thought this does not include time spent in customs. Express Mail is faster, but more expensive. USPS mail shipments are not time-definite and do not give detailed tracking, though we can see when the package leaves the US, enters foreign customs, and leaves foreign customs for delivery. International Priority Mail is generally our recommended postage option for international addresses. UPS has a time-definite delivery and provides a detailed tracking number. UPS is usually the more expensive option. Available as either UPS Expedited or UPS Express (1-2 day delivery.) Customers in Canada can choose 'Canada-UPS Standard' as a shipping option and receive reasonable rates. Please not that UPS often charges Customs Brokerage Fees in addition to the shipping amount. These fees are collected by UPS, and we do not have a way of calculating them, nor is WesSpur in any way responsible for them. Please note! Selecting a shipping option that is for the U.S. only (such as UPS Ground or regular Priority Mail) will result in the computer giving you a misleading shipping amount. If you choose a shipping option that is for the U.S. only, but your address is outside of the U.S. we will change your shipping method to the least expensive valid option and charge the correct amount. We will always try to contact you in these circumstances so you are aware of the actual charges. Our free shipping option is valid for the contiguous U.S. only, and does not apply to International Orders. Any packages that are refused delivery will be returned to WesSpur. In these cases shipping will not be refunded and in addition shipping charges will be collected to cover the return freight to WesSpur. Your local government may charge taxes and duties on your shipment of items as they are imported goods. WesSpur does not collect this money, nor can we estimate the amount for you. Your local post or trade officials should be able to help you estimate the duty and tax on your order. All prices listed on this website are in U.S. Dollars. Your credit card company will convert your order to your local currency when you receive your statement. This currency converter can be used to estimate the prices in your local currency. WesSpur charges state sales tax where applicable. Note: International customers may still be responsible for Import Duties or VAT when your order arrives. Check with your local postal system for more information. Transactions at WesSpur.com are processed by the world-renowned shopping cart software NetSuite. NetSuite encrypts all data used during the transaction to ensure the protection and privacy of your information. The information you provide during checkout is used by WesSpur to complete your order. All shopping transactions are encrypted and secure. What happens with my private information? We do not sell, trade, or otherwise distribute your name, address, phone number, or any other information you give us. WesSpur values your privacy and the trust you place in us. That's why we will never share your information with other parties, except as necessary to complete your order. (Shipping companies, for example, or a vendor company if we needed to have an item shipped to you directly from the factory.) We do mail catalogs to our customers, unless they wish to opt out. We may send special offers from time to time, but these are on an opt-in basis. I've ordered the wrong style/size. Can I exchange it? Exchanges can be done on any equipment ordered within 90 days of purchase as long as the items are new and unused. Please call (800) 268-2141 or use our online contact form and ask to make an exchange. We can accept the returned item, and ship an item of equal value to you when your return has arrived. If you are in a hurry, we can ship and bill you for the replacement items, then credit you for the return when it arrives. Please have a copy of your receipt, invoice or order available. Customers are responsible for arranging return shipment on exchanges. Special order and clearance items may not be returned. I've used my equipment. Can I still return it? What if I receive defective equipment? WesSpur stocks the highest quality tree gear and ships packages carefully to ensure everything arrives in top condition. Sometimes however, an item may be damaged in transit or fall below manufacturer standards. Please inspect your order when it arrives. If you have received any damaged or defective equipment, call (800) 268-2141 or use our online contact form and we will arrange return of the defective item and ship you a replacement item. You can also login to your WesSpur account and request a return by clicking on the "Request at Return" link on the My Account tab. If an item appears to be defective after it has been used, it can usually be replaced or repaired under the manufacturer warranty. In the case of items used in the field, we will sometimes have to arrange the replacement or repair with the manufacturer. In these cases, we will help you arrange the replacement. Please note that no manufacturer warranty will cover items that are damaged due to misuse or ill-treatment. We cannot replace items that are broken or damaged by being dropped, having trees fall on them, being run over, or are used in situations for which they are not intended. Items such as ropes, carabiners, and pulleys have load ratings which should not be exceeded. Such items will not be replaced if they fail when used in situations exceeding their capacities. Return authorizations are available by logging into your WesSpur account if you created one when you ordered, and clicking on “return items” from the order, or by calling (800) 268-2141 and requesting a return. Please have a copy of the invoice/receipt that came with your order, or your email confirmation on hand. Customers are responsible for arranging return shipment on returned items. WesSpur is happy to special-order anything carried by one of our vendors for you. When you call to place the order, we will take down what you want and confirm the total price and availability with that manufacturer, and update you with the total and expected arrival time before completing the order. Special order items are non-exchangeable and non-returnable. Does WesSpur offer discounts for purchasing in large volume? If you buy more than $3000 worth of arborist equipment a year you may be eligible for special pricing or incentives. To find out more please click here visit our volume purchasing page. Does WesSpur offer accounts for municipalities or government agencies? If you are a municipality or government agency and would like to either get set up on account it is very easy. We have a very simple form that you can fill out online. Your account can be up and running in minutes, with Net 30 account terms. (30 days to pay the balance of the bill.) We are also happy to supply quotes/bids for your organization. Please visit our municipal purchases page here. How do I become a reseller of WesSpur equipment? If you are interested in purchasing equipment for resale and would like More Information on how to get set up with a wholesale account please visit our wholesale account page here. Our website shows when items are in stock or out of stock. Items that are out of stock can still be ordered, and we will ship them as soon as they are available. Typically, we will ship the rest of your order and backorder out of stock items, to ship when available. If there is a delay longer than a few days, we will contact you to let you know and you can decide how to proceed. The new WesSpur shopping cart offers you the opportunity to register as a customer and save your information for later use. This is secure, saves time, and is entirely optional. If you do not want the web store to save your information for your next visit, when you check out click on “New Customer” and fill out the fields under “New Customer Order Information” only. If you would like to save your information for later use, then create a password and password hint for use on your return visit. (Passwords should be at least 8 characters, a mix of numbers and letters, include some capitals, and be hard for someone else to guess.) Passwords should be memorized or store in a secure place. You may access your account by logging in during checkout, or by clicking the “My Account” tab in the bar at the top of the screen in the shopping cart. If you are using a public computer, please be sure to sign out of your account using the link at the very top of the screen in your account or the shopping cart. Items you have previously ordered at WesSpur.com can be quickly ordered again by logging in to the customer center and clicking "Re-order Items". This will bring up a list of items you have ordered from WesSpur and allow you to quickly put together a new order. Help! I can't see prices on the website!